The same year as the Tribe’s debut, Phife was also diagnosed with type 1 diabetes, a disease he once described as a “24/7 type of job,” about which he spent the rest of his life spreading awareness. 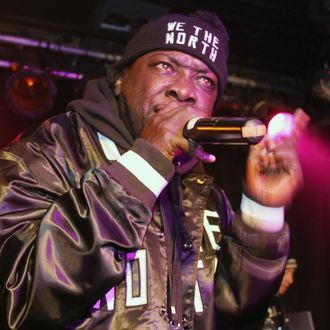 Despite his illness, Phife stuck with the Tribe for their next four albums — particularly refining his style and sharp lyricism on 1991’s The Low End Theory and 1993’s “Electric Relaxation” — until the group called it quits after their fifth album in 1998. Phife, who fans also know as the Five Foot Assassin and the Five Footer for his five-foot-three stature, went on to release his first and only solo album with 2000’s Ventilation: Da LP. Future plans for a solo career were derailed due to persistent health problems, which included having to undergo a kidney transplant in 2008 following renal failure. He and the Tribe continued a relationship, albeit an often a strained one, and would go on to reunite multiple times over the next 15 years, beginning with headlining 2004’s Rock the Bells concert up until Q-Tip announced the group would be opening for Kanye West’s Yeezus tour at Madison Square Garden in 2013, which he said would be Tribe’s last performances together. They did, however, play what is now their final show together on The Tonight Show last November, 25 years after the group’s debut album. Their contentious later years — and Phife’s continued battle with diabetes — were documented in Michael Rapaport’s 2011 documentary, Beats, Rhymes & Life: The Travels of A Tribe Called Quest, which was plagued by behind-the-scenes disputes between the group’s members that spilled on camera.